Creach Bheinn is awkward, despite being close to Oban. It sits round the back of the hills if you know what I mean. This doesn't matter if you want to stay at Eriska Hotel, canoe the Falls of Lora, see mirror-calm reflections in Loch Creran or ogle Castle Stalker. 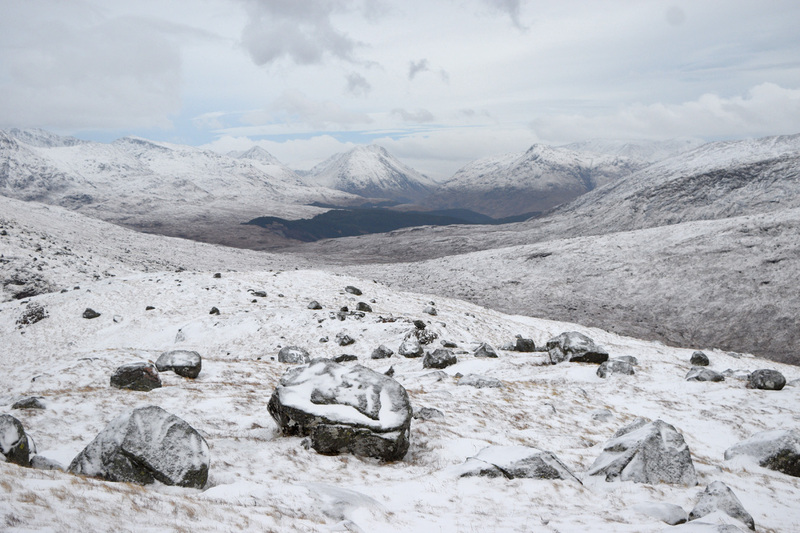 But to most hill-baggers, the A828 is the road less travelled - despite sights like this. Yet Creach Bheinn isn't far from the Central Belt. 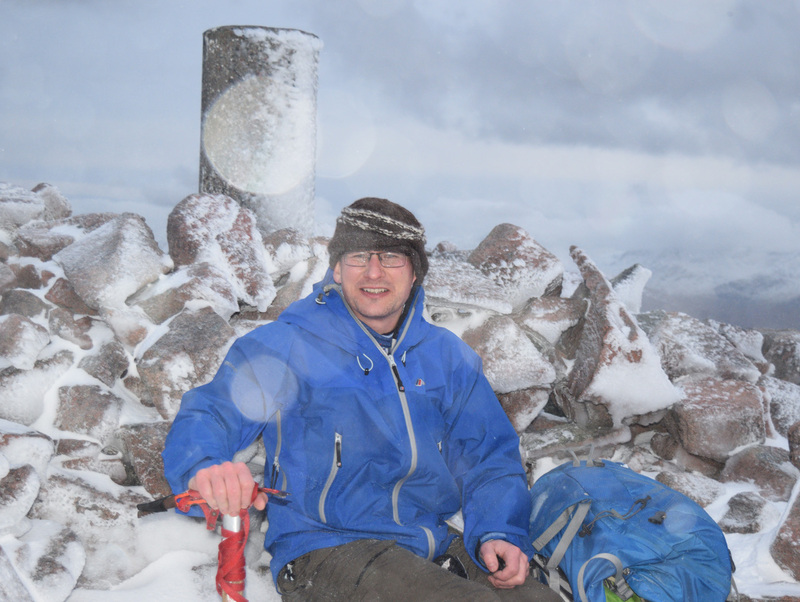 I hadn't climbed a Corbett for over four years (my last being Morven on the last autumn day of 2011). Appalled at this oversight, I invoked a hill day. My companion Alastair wasn't bothered so long as we got away. But to me this tick was totemic. People had gained degrees in less time than it had taken me to do one Corbett. A handy landrover track, not marked on the map, heads up the Allt Buidhe from Druimavuic. It was already 1pm so we took it to gain height fast, reaching the snowline around 300m. It had been a surprise to see as many as three cars parked at the bottom of the track, and we passed a man descending, complaining of the track being like Sauchiehall Street. A Happy New Year to you too! Once on the hill we realised we were the only ones to go this far today. There were no other footprints. It wasn't hard to see why nobody else had gone further. A ferocious wind battered us with stinging spindrift made of hail. The wind screamed from the southeast, rising as the short afternoon wore on, firing hail like shotgun pellets. The conditions caused us to stagger at times, painfully cautious of the spots where the snow cover had been scoured bare to reveal treacherous patches of knobbly ice. We had been out in worse, but lack of practice lent an unaccustomed air of seriousness to our endeavours. I attempted a drink of water on the summit, only to find the water in my bottle had frozen. Pretty standard stuff for winter hillwalking, but I had forgotten that sort of thing happened. I took my gloves off for three minutes to arrange a summit photo and my hands didn't warm up again for half an hour. We returned to the car at 5:30pm. Thanks to the conditions, we had experienced something grander than the short duration of the walk deserved. How incredible to think we had been battered by sub-arctic blasts and seen a sunset over the Hebrides, yet could be enjoying a hot bath, meal and warm bed in our own homes in Edinburgh in under three hours! But that wasn't what happened. Instead, we went to a bothy.